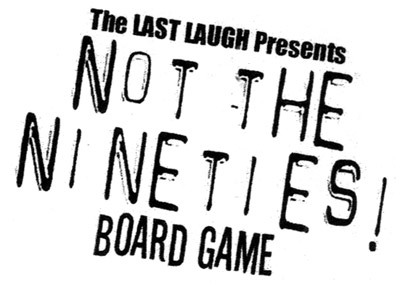 The May 2000 issue of The Last Laugh contained a do-it-yourself board game as its centerfold. It was called Not The Nineties! I don’t know if anyone ever played it; I doubt it. The potshots are pretty brutal for a fun diversion. What can I say, the 1990s were actually pretty brutal themselves. The game provides a reasonably accurate simulation of trudging through ten unpleasant years. Comments Off on Not The Nineties! A time slot on a major cable network is both a blessing and a curse. On the one hand, you couldn’t ask for a larger audience. On the other, you’re the property of the company store, and you bend to their whim. For example, MTV aired Beavis & Butthead, but to pad out the episodes to sitcom-length, they inserted music videos with Mike Judge doing commentary in character. At the time, I could appreciate the necessity of this, being that ink-and-paint animation takes time to create. Still, it was obvious that the idea was cribbed from MST3K, and much of the music was unlistenable, or not worth the mockery. 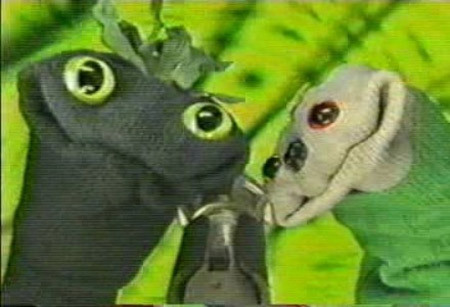 MTV pulled the same jazz when they aired the extraordinary sock-puppet comedy The Sifl and Olly Show, from 1997 to 1999. Videotape artifacts are subconsciously comforting. Videodrome, my local video store, often features used DVDs at clearance prices. There was a copy of Mike Judge’s Extract for $3. I’m a huge fan of Judge’s film and television, so I Netflixed Extract upon its release, and truthfully, I was underwhelmed. But a friend who also enthuses upon Mike Judge loved it, and $3 was just right to give it another chance. What happens when a company has no idea how to market a film. “I didn’t really get this one,” the clerk said as he rang up my purchase, “and I love his other stuff.” I told him a theory I’d read that Office Space was for the workers, and Extract was for the bosses, reflecting Judge’s ascent in the studio system. I also noted that Idiocracy was an impossible act to follow, and that it wasn’t well-received upon its (delayed) debut. I figured if I remained ambivalent about Extract, I could gift it to my friend. From 1991 to 1995, the animated femme fatale Æon Flux appeared on MTV (of all places), at first in shorts that appeared on the variety program Liquid Television. She was created by Korean animator Peter Chung, storyboard artist for Transformers: The Movie (1986), and veteran of cartoon shows like Rugrats and Ring Raiders. Rob Liefeld learned everything he knows about female anatomy from this single image.